PDF is perhaps the most popular format for file downloads and viewing. 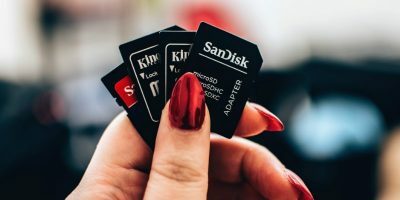 That’s because this format can be handled on all kinds of devices without hardware, software, or operating system constraints. The security and portability of this file format have also contributed a tremendous boost to its popular use. However, just like any other file format, PDF is also susceptible to threats of data corruption. Should you encounter problems opening a PDF file, chances are it may be corrupted. In such instances, you’ll need a professional recovery software, such as Recovery Toolbox for PDF, to repair and recover data from the damaged PDF File. 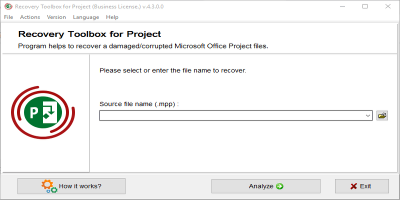 What Causes a PDF File to be Corrupted? 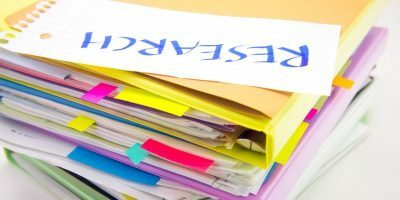 There are many reasons why a PDF file can become corrupt, but the most common one is that the PDF file was created on a substandard PDF creator. Even editing a PDF with a sub-par PDF editor can result in data corruption. Viewing of PDFs online rather than downloading them first is another reason why PDFs suffer corruption. Many users report that at some point, their PDFs refuse to open after viewing them multiple times online. Always use a dedicated reader to open PDFs to prevent incidences of file or data corruption. Other possible causes of PDF file corruption include virus attacks, system failures, and hard drive failures. Also, connection problems or a power outage when downloading may cause partial downloads and an eventual file corruption. 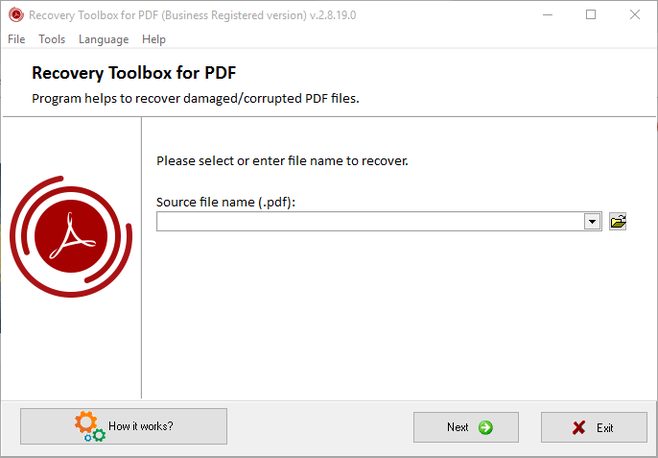 Now that you know what causes PDF corruption, we’ll show you how to repair a corrupt PDF file using Recovery Toolbox for PDF. 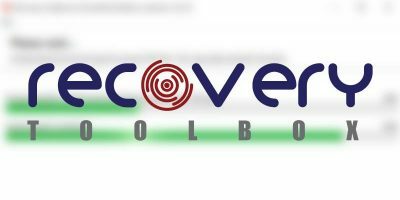 What Is Recovery Toolbox for PDF? As the name suggests, Recovery Toolbox for PDF is a software program designed to repair and recover data from damaged PDF files. This program features a sophisticated recovery engine that aids in the recovery of data from PDF files that have suffered all forms of corruption. And not just plain text – this application can also recover graphics and images without compromising on data integrity. 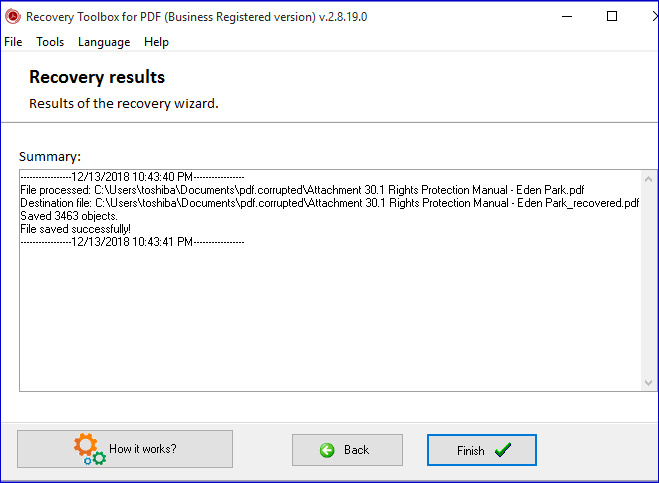 Recovery Toolbox claims that this software supports documents of all versions and sizes, making it easy to fix a vast range of errors and save your data to a new PDF file. But how good is it at repairing PDF files? We’re just about to find out. But first, let’s have a glimpse of the features that distinguish it from the competition. 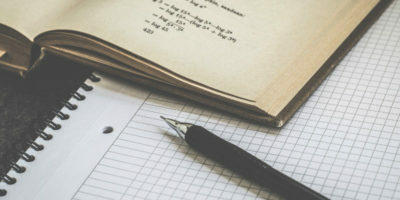 Utilizes an intelligent recovery engine that employs advanced document analysis techniques to identify and fix file errors. 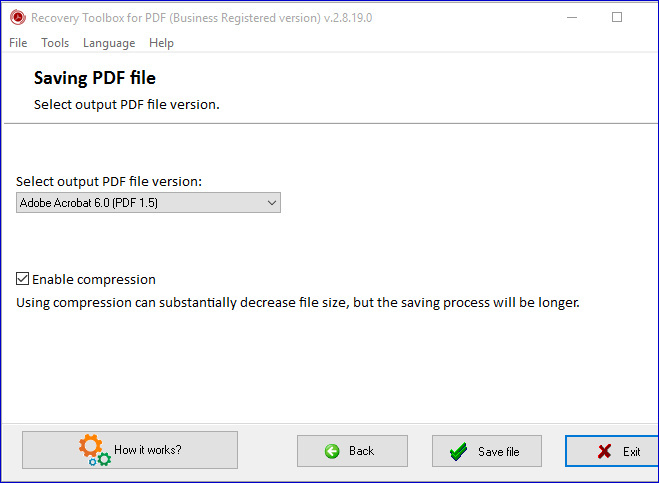 Recovery Toolbox for PDF is fully compatible with all the major versions of Windows, including Windows 10. 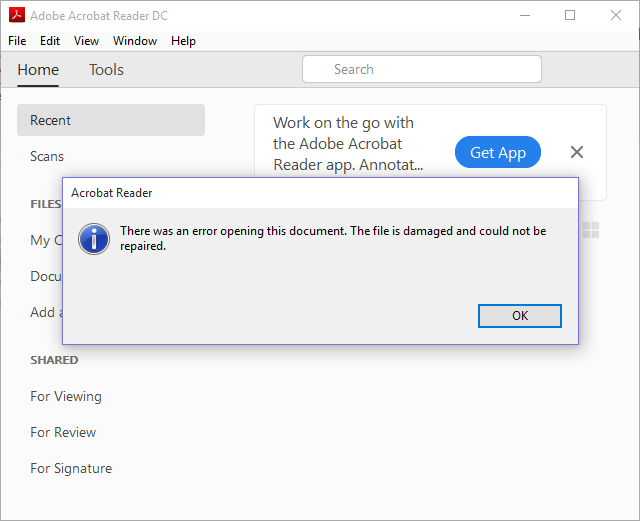 If a PDF document is corrupted, Adobe and other standard PDF readers will not be able to open the file. Instead, you’ll get an error message that the document you’re trying to open is damaged and could not be opened. The following image is the message that Acrobat Reader displayed when I tried to open a corrupted PDF file. 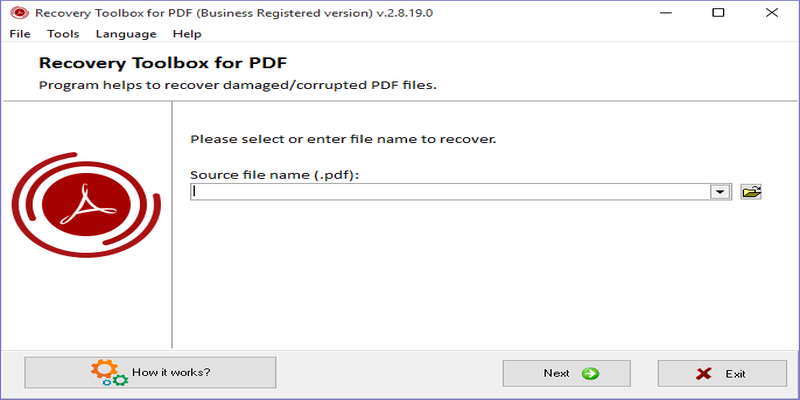 Now we’re going to try to repair this document using the Recovery Toolbox for PDF. To get started, you’ll first need to download and install the software into your computer. The below instructions show how to go about that. 1. Head over to the company’s official site and download the software. Once the download is complete, double-click the .exe file and follow the simple installation instructions to install the application. One thing you’ll notice is that the user interface is clean with straightforward instructions, making it super-easy to use. 2. Click the folder-shaped icon to select your damaged .pdf file. 3. Click the “Next” button to continue. 4. Specify the output file name. 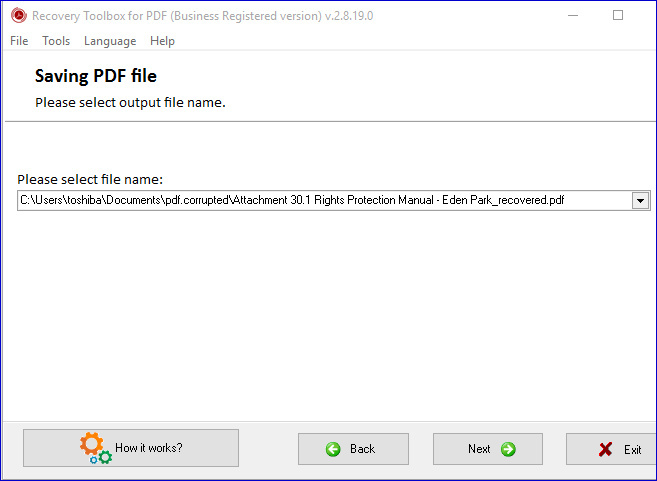 Normally, the software will save the recovered document to a new PDF file in the same folder as the original file, and with the same name as the source file but with the word “recovered” at the end. But you can change that, too. 5. Select the output PDF file version, then click “save file” to continue. The software will analyze the corrupted file, identify the errors, and recover the document. You’ll also be able to see the number of errors identified as the software continues to analyze the file. 6. Once the system has completed analyzing and recovering the source file, click the “Next” button to complete the recovery process. It will then display a summary of the recovery results, including the number of saved objects. That’s it! You’ve now repaired and recovered your damaged PDF file. Click Finish to exit and close the program. Now open the recovered document to see the nature of the recovered content. 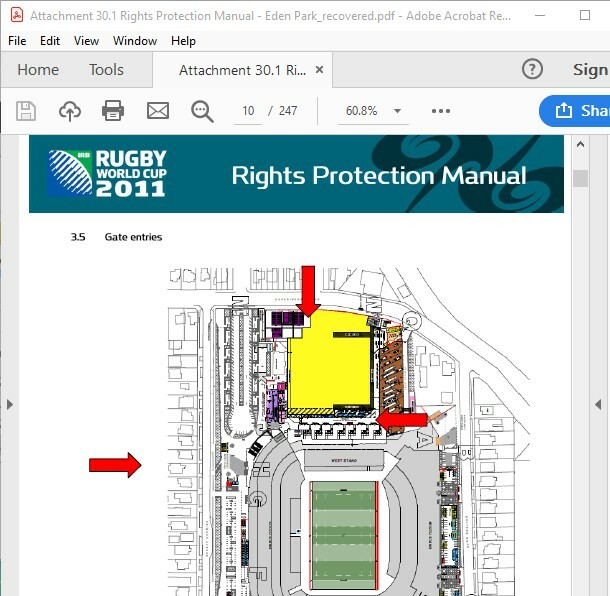 Here’s what our recovered PDF file looks like. As you can see, Adobe can now read the new file. The software managed to recover both text and graphics as they were in the original file. 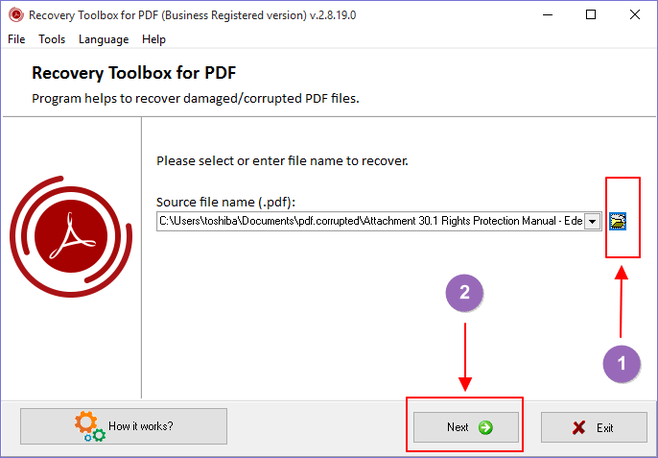 Recovery Toolbox offers three options for the PDF repair software: Personal license, Business license, and Site license. This license is for personal use or for use in non-commercial environments. You get a lifetime license for that price. 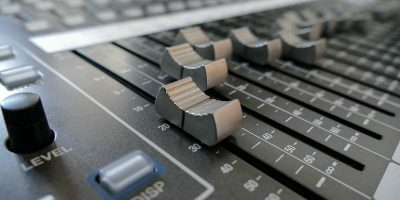 This option is ideal for you if you want a license for use in an office setup or if you want to use it for commercial use. It’s specifically for legal use in an enterprise or a government environment. Ideal for large-scale projects, like on construction sites. With this license you can use the software on several computers (up to 100) either in the same building or distributed across several buildings. 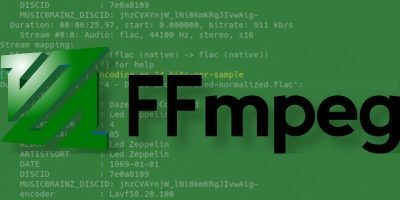 In a market that is flooded with PDF recovery tools that claim to repair PDFs for free, it’s easier to gravitate towards this direction. However, if you’re serious about repairing and recovering data from important PDF files, we recommend you go for a paid program, and Recovery Toolbox for PDF is your best bet. You can also try their Online PDF Repair Service which does pretty much the same thing, and it doesn’t require you to download or install anything.